Shakespeare’s work has been adapted in numerous different ways, from films of Romeo and Juliet to a dance-theatre version of Macbeth – not to mention translations into hundreds of languages. 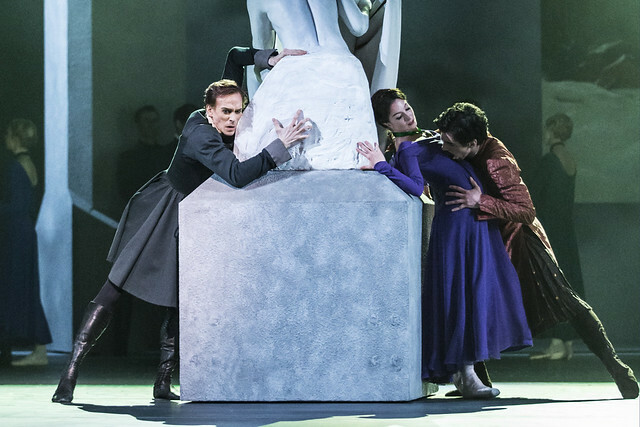 But Christopher Wheeldon’s ballet of The Winter’s Tale is not just a choreographic adaptation – it tells its story through the coming together of many different elements. Shakespeare’s tale is not only retold but interpreted afresh through a multiplicity of media. With its specially written score by Joby Talbot, designs by Bob Crowley, lighting by Natasha Katz, projections by Daniel Brodie and silk effects by Basil Twist, it’s a work that has collaboration at its heart. Take Crowley’s set and costume designs, which do so much more than set the scene. Act I, set in the court of Sicilia, begins as a wintry idyll marked by deep, rich colours: the purple of Hermione’s dress, the dark orange-red of Polixenes’ shirt and velvet coat. After her arrest and the confiscation of her newborn child, however, Hermione returns to the stage in all white: she seems pale and broken, little like her former self. Leontes, too, sheds his dark overcoat to reveal a white shirt and appears vulnerable: his jealousy – as he realizes too late – is destroying both of them, as well as their son Mamillius. In tandem with Katz’s startlingly sombre lighting for this scene, Crowley’s designs immediately convey the essence of the characters’ development, giving Wheeldon’s choreography the freedom to scrutinize the relationships between them. 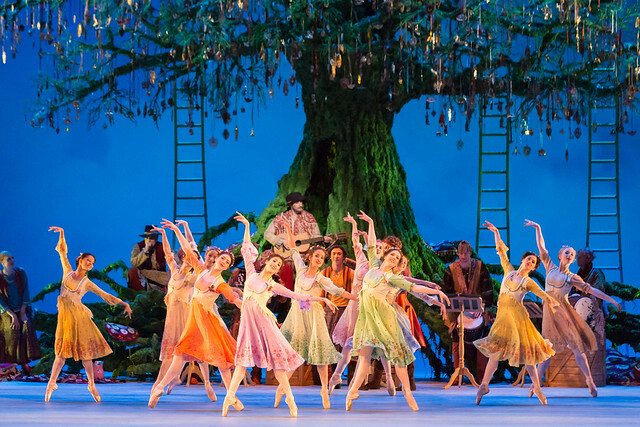 What a contrast the Bohemian Act II is, with its verdant tree and vivid, bright costumes. Nothing, on the surface of things, could be more different from Act I – but it’s the costume design that provides the link between them. Perdita, the lost daughter of the Sicilian court, wears a purple dress – a slightly shorter version of the one her mother Hermione wore before. Through this subtle detail, it’s immediately clear who she is. Likewise, her lover Florizel’s coat recalls that of his father Polixenes in Act I, although the brasher colours and simpler materials he wears underneath this coat add detail to his story: here is a royal with a taste for adventure beyond the confines of the court. Paulina, the head of Leontes’ household, opens Act III in a dark shift, still in mourning. All the costumes, in fact, now convey an atmosphere of sober penitence: the court has not recovered from the devastating effects of Leontes’ jealous madness 16 years earlier. The sudden appearance of the Bohemians creates a clash of costume style, but after the young couple’s true identities are made clear, all is resolved into a soft palate of cream and white for the wedding scene, gently adorned with yellow flowers in the women's hair. There is no place now for the vibrancy of Act II – Leontes’ sense of guilt remains, and so does the loss of Mamillius and Paulina’s husband Antigonus – but as the characters move gradually towards acceptance, the darker mood in which the act opened is dispelled. The Winter’s Tale runs 12 April–10 June 2016. Tickets are still available. 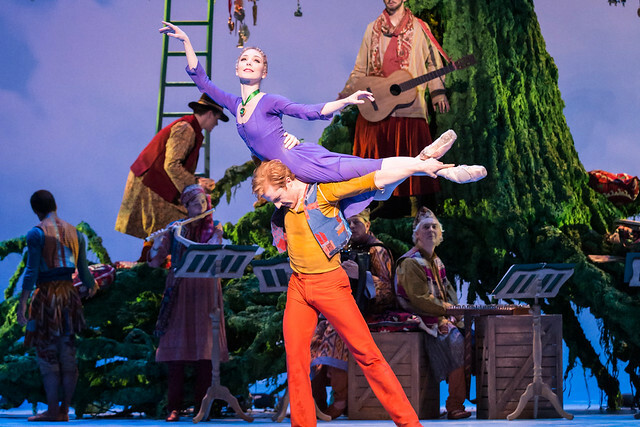 The production is a co-production with the National Ballet of Canada and is given with generous philanthropic support from Anna and Moshe Kantor, Lindsay and Sarah Tomlinson, The Royal Opera House Endowment Fund and The Friends of Covent Garden. The tree is spectacular. It's a wonderful imaginative colorful piece of art.